Enbridge Energy has just reported that their Alberta Clipper tar sands pipeline is being shut down because they have spilled over 5000 gallons of oil. The spill happened in Saskatchewan, Canada, and it is not yet clear what has caused the leak. Enbridge has reported that the spill occurred at one of their pumping stations but some of the oil has sprayed onto nearby private property. This latest spill is yet another example on why Enbridge should focus a lot more time on pipeline safety instead of rushing and pushing through massive amounts of pipeline expansion projects throughout Canada and the US. 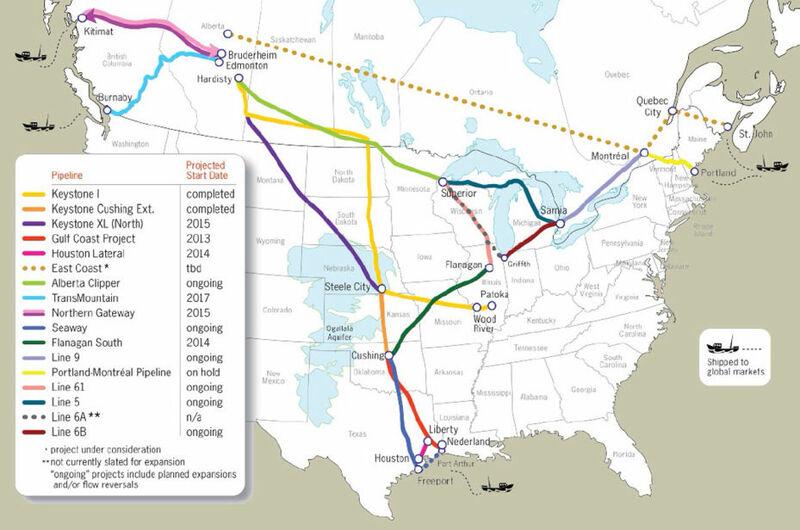 In fact, Enbridge is currently trying to gain approval in both canada and the US to expand the Alberta Clipper pipeline. They want to increase pressure on this pipeline from 450,000 barrels per day to 880,000 barrels per day! The Alberta Clipper tar sands pipeline is the beginning point for all the Enbridge expansions throughout the Great Lakes, which will make the largest freshwater system, in the world, a super highway for transporting and refining tar sands. Enbridge is even one of the companies behind the recent proposal to ship tar sands, via tankers, throughout the Great Lakes. The Original CAO noted that the history of failures on Respondent’s Lakehead Pipeline system, the defects originally discovered during construction of Line 14, a 2007 failure on Line 14, and the July 2010 failure on Line 6B in Marshall, Michigan, and additional failures throughout all parts of the Lakehead System indicate that Respondent’s integrity management program may be inadequate. PHMSA has communicated its longstanding concerns about this pattern of failures with Respondent over the past several years. Given the nature, circumstances, and gravity of this pattern of accidents, additional corrective measures are warranted. Despite this unprecedented corrective action order, and several failures since, PHMSA is still allowing Enbridge to expand many pipelines along the Lakehead system, including a 60-year-old pipeline that runs under the Straits of Mackinac. There are several easy online action tools that allow you to reach out to the decision makers behind these proposals. Please consider taking a few moments to fill these out to show your opposition to the major risk Enbridge continues to build in the Great Lakes. Contact the Department of State and let them know that Enbridge should not be allowed to increase pressure on the Alberta Clipper pipeline. Also, please contact your US Senator and let them know that Enbridge should never be allowed to increase pressure on a 60-year-old pipeline that runs through the heart of the Great Lakes. Well if BP executives suffer no punishment for poisoning the Gulf of Mexico, and Tepco can nuke the pacific ocean and then simply change their name, why on Earth should Enbridge Energy care in the least how much damage they do, as long as they’re still making money? WE are the only people who can enforce the law against these monsters, because everyone else with the capability to is a wholly owned subsidiary of theirs. J.R. Your exactly right. The more they get away with the more they do.